One of the more interesting folds of the comic book medium is the level of artistic demands it makes on the illustrator. Occasionally you will read a book containing literally thousands of panels that could each be a painting in a gallery, perhaps selling for tens of thousands of dollars a piece. And yet this book with all of these images that would otherwise be considered greatly valuable will rarely sell for much more than 20 dollars. 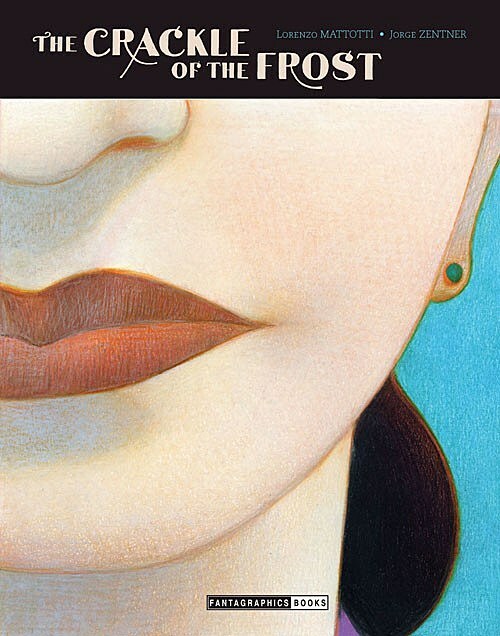 There are few mediums that ask for this level of craftsmanship while offering so little in return, and there are few artists who make that sacrifice feel more acute than 30-year comics veteran Lorenzo Mattotti, whose graphic novel The Crackle of the Frost (with Jorge Zentner) has just been released in English by Fantagraphics. A meditation on fear and a demonstration of his frequent genius, the book makes a fine choice for the Mattotti newcomer. WARNING: Some of the following imagery may be considered not-safe-for-work. 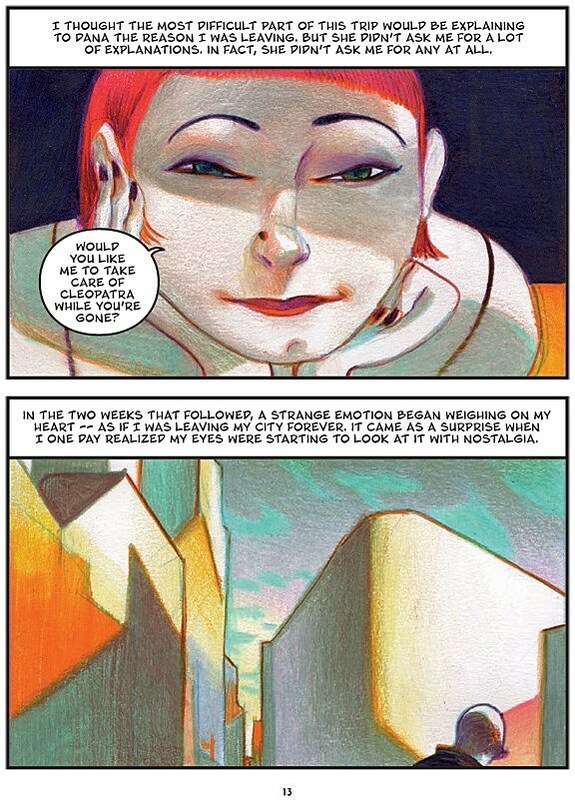 When I first became acquainted with Mattotti it was through his book Stigmata, which is done in a super raw, scratchy style that exists almost in open revolt on the page. This rawness was originally what drew me to his work, but as I looked deeper into his oeuvre (a process greatly aided by this three-hour podcast interview at Inkstuds) I noticed a completely separate style that he actually works in predominantly, the style that Mattotti employs here in The Crackle of the Frost and in earlier works such as Fires and Dr. Jekyll and Mister Hyde. 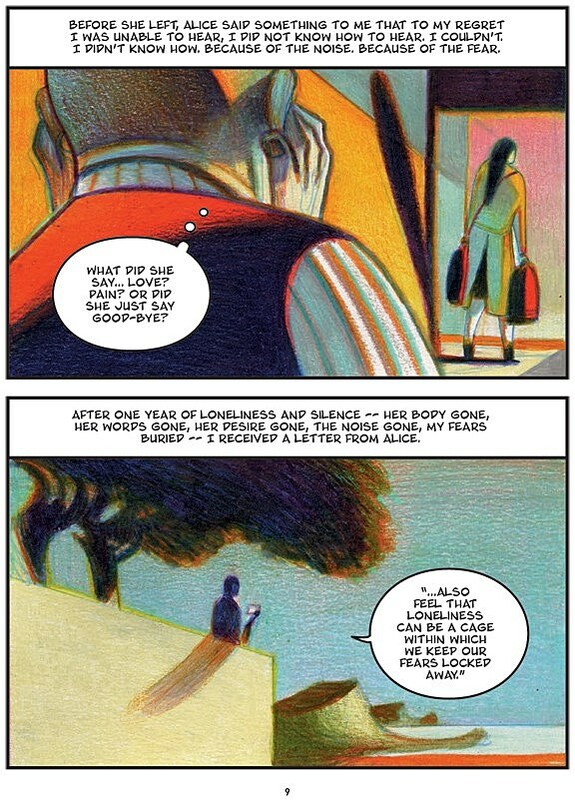 In this style, he employs beautiful pastel colorings of shapes and shadows, where form, even more so than in Stigmata, takes a backseat to deep psychic metaphor. 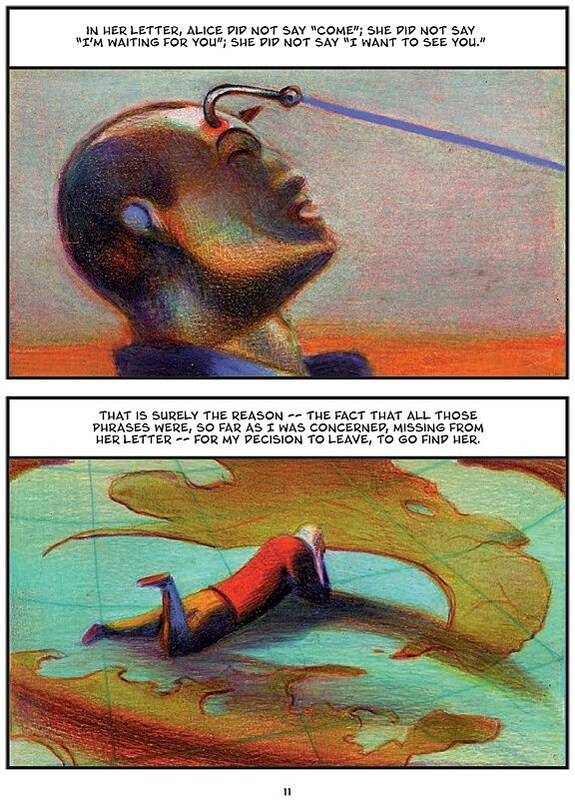 The nearest thing that I can compare it to from my own reading experience is Bill Sienkiewicz from the 1980s, who was another artist that was prepared to do whatever was necessary with form and style in a given panel to best communicate the true meaning of that particular narrative moment. 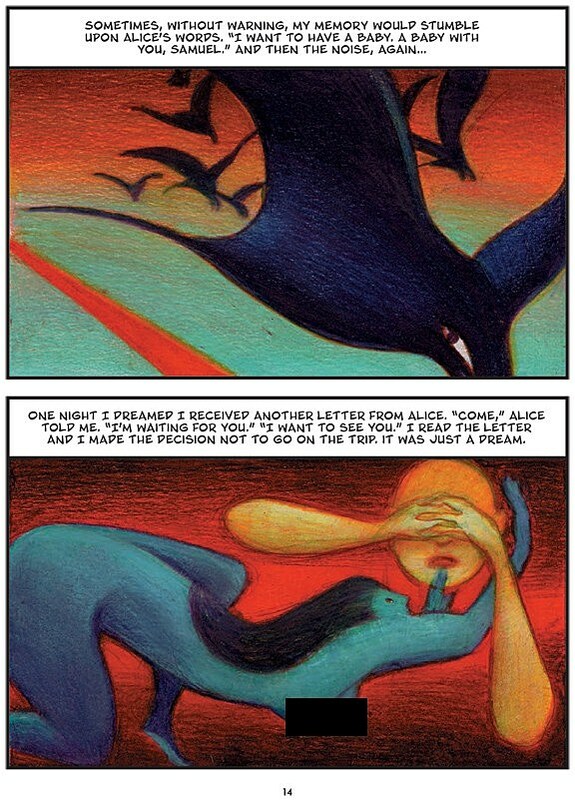 This approach yields a perfect manifestation of an artist who is in control of the role style plays in storytelling. It is an understanding of the way that style can control and dictate mood. And more than that, it is the understanding of a script as more than recipe; something to be expounded upon, riffed on, and with which to embark on a journey. So with that said, my interest in The Crackle of the Frost was primarily an artistic one. I knew that it was not written by Mattotti, but I really had no expectations or idea of what Jorge Zentner was about, or what the story would entail. And yet it was a release that I was eagerly anticipating through the course of the year. My take was mostly, "It's MATTOTTI... who cares what the writing is like?" 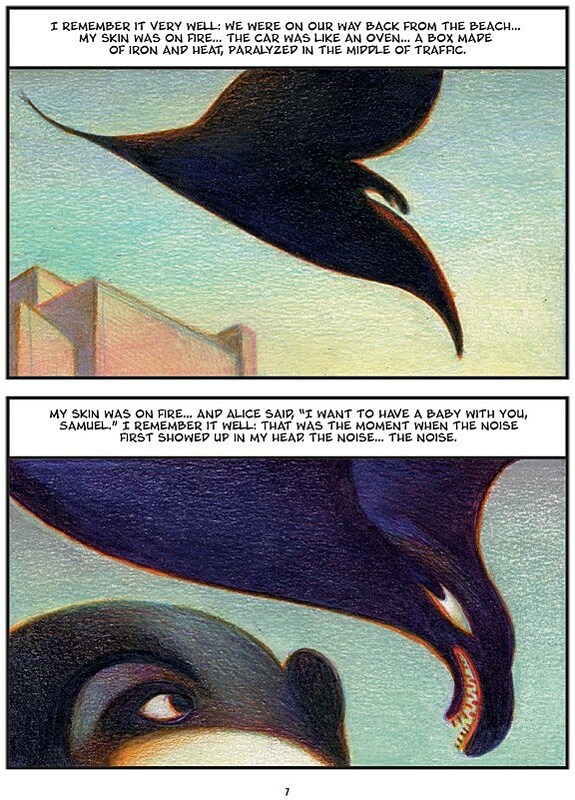 But it turned out I quite enjoyed the narrative elements that Zentner brought to the work. Zentner is primarily a psychotherapist who also writes. I think it is his experience as the former which most informs the charms of his work in the latter in this book. On the one hand, the basic plot of the story is very straightforward: A man, Samuel, breaks up with a woman because of her desire to have a baby with him. He then receives a letter from the woman some months later. The central narrative question of the entire book is contained in this letter from this woman, Alice, where she writes: "Loneliness can be a cage within which we keep our fears locked away." Because of the epiphany he receives upon reading this phrase, Samuel goes on a quest to reunite with Alice and also to understand the nature of the prison of trauma within which he finds himself, walled off from the world. In order to gain this understanding, Zetner has Samuel reexplain the relationship of these concepts over and over in different settings and situations until he can finally break the psychic fracture down into enough workable parts and begin the process of healing. 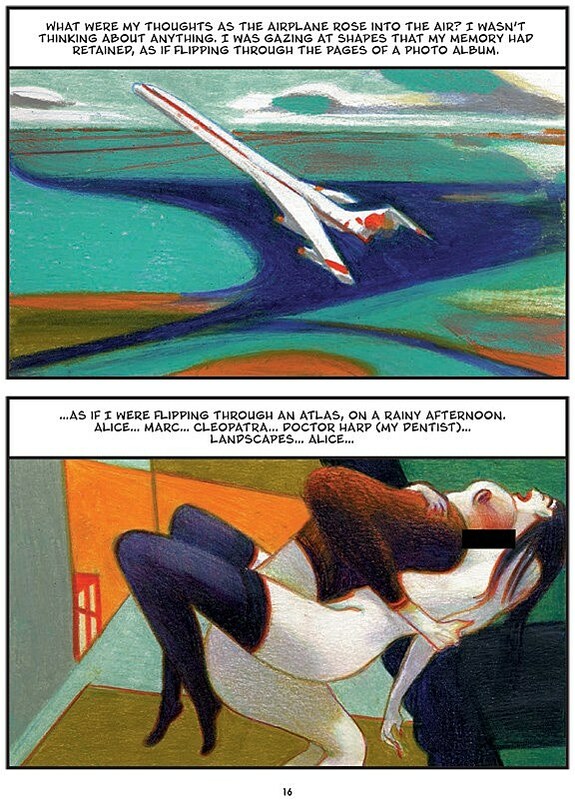 Ostensibly we have a quest narrative told in two panels per page (the book first appeared in the form of a newspaper strip, but was always designed with this book layout in mind). 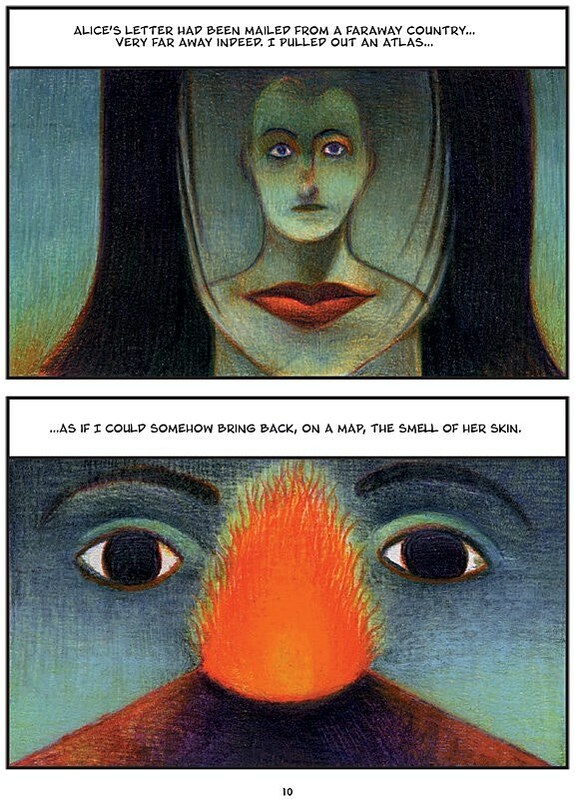 Zentner's writing is thick in poetry and symbolism, and matches Mattotti's art quite well, resulting in some beautifully sublime moments throughout the book. For his part, Mattotti's work on the book blends the poetic symbolic language of Zentner's words into beautiful emotive images. He doesn't explicate Zentner's words so much as bend them like notes into deeper metaphors. It is actually somewhat difficult to pick just one highlight out of the book because the way it is constructed -- divided up into six parts with each section sort of built around a rising and falling action that's oriented around a particular pyschic breakthrough. 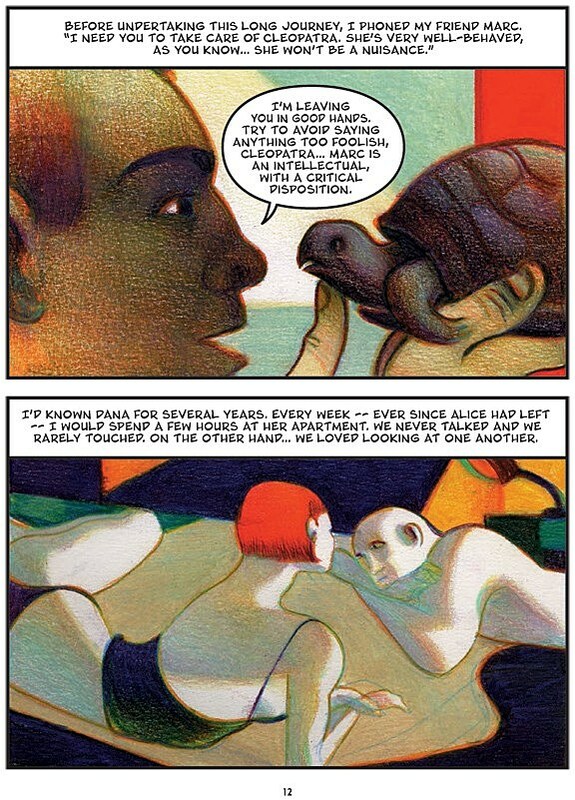 I think the most impressive thing with Mattotti's work is how unrelenting he is in his usage of the core symbols and language of the comic as a whole. We are constantly seeing variations of darkness, fire, and cages. There's one sequence where Samuel finds a secluded pool of water and a mural of a flute player holding a cage -- a cage which he says holds all of the world's truths, truths that we know from previous passages also contain Samuel's fear that he has manufactured a blindness towards. Samuel looks into this pool directly, and Mattotti draws a wonderful image of a red, fiery reflection looking back up at him. What is notable is that there is also a cage surrounding the two faces. 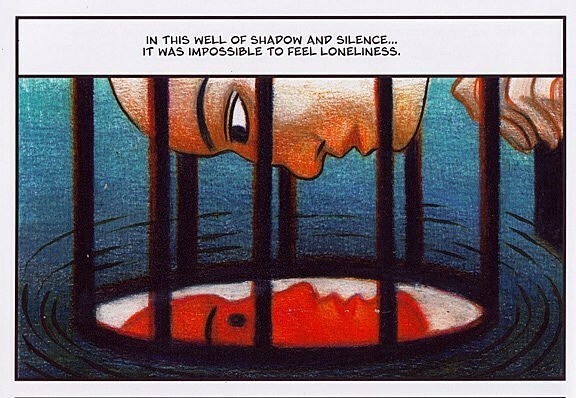 The caption for this panel is, "In this well of shadows and silence... it was impossible to feel loneliness." 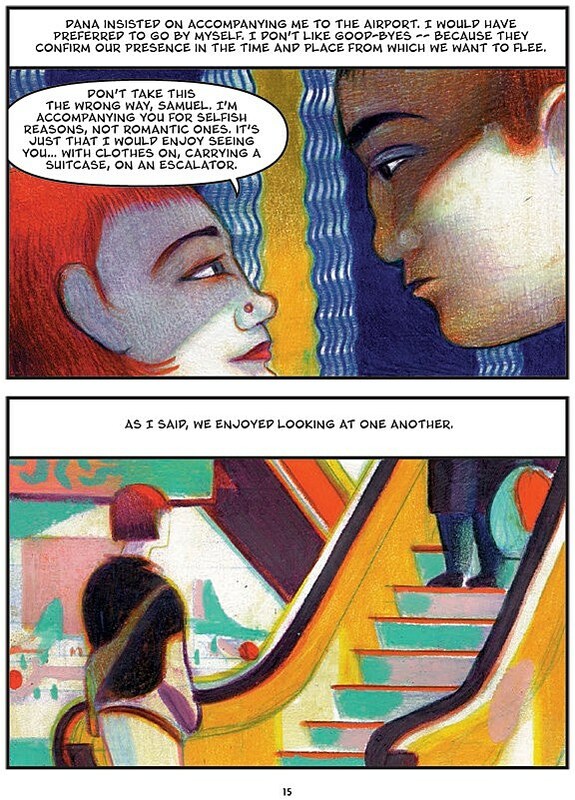 It's a moving narrative moment in its own right, but coupled with Mattotti's artwork the meaning is expounded: we know that the reason Samuel doesn't feel alone now is because he is looking directly into his own caged fear. We see even at this midway point that Samuel's salvation will only come when he is able to give himself over into them. It's one of the many beautiful moments of image and text that exemplify that sweet spot of genius when a master is at work. These moments surpass much of what anyone else can even hope to accomplish in the medium right now. I mean, there are pages here that you can read and as a cartoonist just say, "He's not even playing the same game that I am." 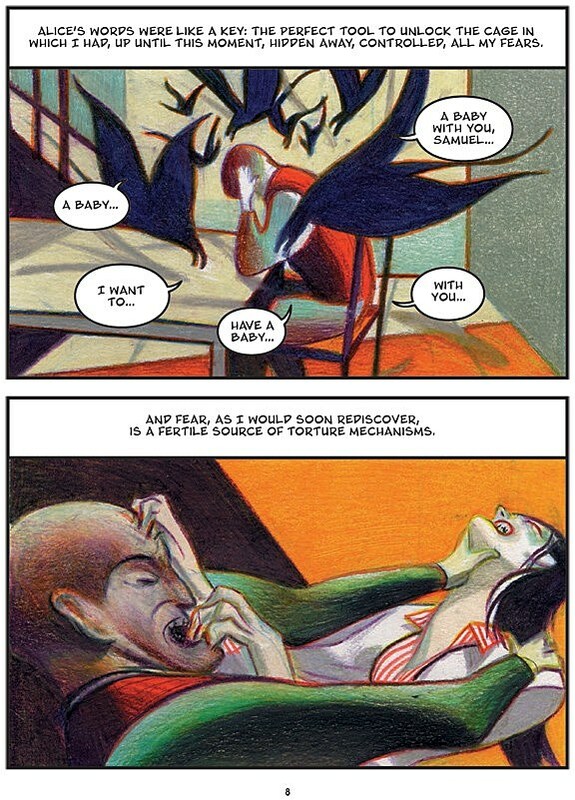 The difficulty in reviewing The Crackle of the Frost is that while I think the book is very much worth owning because of these the kind of scenes and images I've described, as a whole I don't think it's any better or worse than the rest of Mattotti's graphic novels. Mattotti is in some ways a master of the medium, even though he doesn't really have that one true masterwork that you would one hundred percent recommend above any of the other book. They are all terrific and I am always proud to add a new Mattotti book to my collection. But there is something here, perhaps in the narrative, even, that just does not go far enough. Something that doesn't cash in on the wild potential of this book's best, most transcendent moments. Crucially, there is a section toward the end of Crackle where Samuel relates a parable from a book that he's been reading. It's one of those stories where three people of different classes go to a wise man to have their problems solved and leave with a particular wisdom which they find edifying. This device of the "outside story" was used previously in Crackle, and Samuel just sort of disregarded the information before we saw how those elements came into play later when they added context to the proceedings. These little stories were never in and of themselves the epiphany, but this final story element kind of is itself the epiphany, which makes the breakthrough feel unearned. The last 20 pages cram in a coda of narrative points which seem almost alien compared to the rest of the book, before finally settling on a final scene (which is actually very powerful) from which the book takes its title. But by the time you get to that moment, you feel divorced from the rest of the narrative as a whole. Rather than ending as an exclamation point that builds off of the momentum of all that has come before, you experience whiplash. Imagine you're building, building, building -- Whoa! Huge sidetrack! -- and then you arrive at the thing that which you were building to. This completely undercuts the "oomph" that this book could have had as a contained statement. As it stands, I think what you're looking at in The Crackle of the Frost is a largely amazing new Mattotti release for North American audiences, with fantastic art that has to be seen to be believed. It is a work that is better than most of what you can get on the stands on any given Wednesday. But it's also a book that is hurt by how achingly close it gets to its own perfection. I brought up Sienkiewicz to start this, but I think something like his Stray Toasters is a very good comparison to the canonical value of this work. Which is to say that both that book and this book belong to a classification of "genius at work" that, while distinct from the classification of "genius work," is still a section in the library I would happily see filled any day, every day, and most likely twice on Sundays. In that way, The Crackle of the Frost is disappointing only in the grandeur of its own magnificence. The Crackle of the Frost is on sale now in finer comics shops and bookstores, as well as from the Fantagraphics store, which is offering a free Crackle sketchbook while supplies last.